Over the years, there have been plenty of roleplaying games set in the Roman Empire, from TSR, Inc.’s Glory of Rome supplement for use with Advanced Dungeons & Dragons, Second Edition and Deep7’s entertainingly simple Pax Gladius 1PG to Golden Goblin Press’ excellent The 7th Edition Guide to Cthulhu Invictus: Cosmic Horror Roleplaying in Ancient Rome and Thyrsus Games’ sublime FVLMINATA: Armed With Lightning. To this cohort of titles can be added 43 AD - Invasion & Insurrection - Roleplaying in Roman Britain. Published by Zozer Games, this is roleplaying game set in the first century AD during the invasion and subsequent pacification campaigns by the Roman Empire right up to the campaigns in the Caledonia in the early third century. The players take the role of members of the Legions, soldiers ordered to conduct special missions in order to further Rome’s right of conquest, but doing so far from home, in a hostile land full of natives ready to kill you and druids determined to curse you with their magic, a land said to be on the edge of the world, and a land so cold and wet that socks are a really good idea. 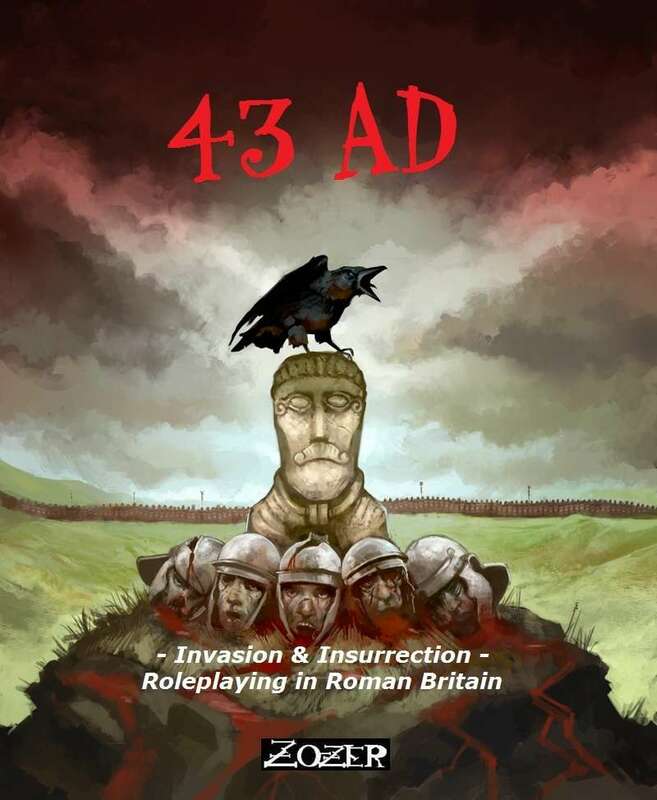 43 AD is thus a historical military roleplaying game set in a world of gods, magic, and the unknown and the untrustworthy, and which is dark and horrible because Britannia is a thoroughly unpleasant place. Yet for all of the actual horror of being assigned to the edge of the world, there may be a truth to the dark magic of the Druids and the tales of witches and monsters which lurk out in the thick forests and the stinking bogs. For there is option for the Game Master to run 43 AD not as a straight historical military game, but as a historical horror military game. So then there really is truth and substance to the folktales about the Flayed Man, Hunting Crows, and the Cauldron Born, and there are Dark Druids who have turned to magics of the blackest kind to drive out the invaders. Characters in 43 AD are members of a legion, from relatively raw recruits to experienced veterans. They come from all across the empire and from all backgrounds, and whilst they may be simple legionaries, they might also be scouts, accountants, scribes, and more. A character is defined by five Attributes—Might (physical and combat prowess), Fate (luck and the will of the gods), Hits (health and endurance), Craft (construction and repair tasks), and Learning (education and social skills); Cultural Origins, which provides a bonus and base language; Character Type, like coward, veteran, or hero, which provides another bonus; Social Class, from Landless Poor to Noble; and Events. Each character has four of these, one explaining why they joined up and the others detailing things that have happened they enlisted. A character also has Allies & Enemies, Background Details, and Wealth & Equipment. To create a character a player can roll dice—just one six-sided die for his character’s Might and Fate, with more dice rolled to determine his Hits, and both Learning and Craft being set at 1 each. Alternatively, a player can divide twelve points between Might, Fate, and Hits. Two six-sided dice are rolled on various tables to other aspects of the character, whilst a percentile dice roll is needed to determine the various events which have befallen him. Various bonuses from this may increase a character’s attributes as well as grant him skills. Background: From near the Rhine where his family are potters, Aulus—Germanic name being Folcher before enlisting—joined the Roman army to prove to his brother that he could be something better as he was no potter. Having training with the tribal warriors, he was already a capable fighter and an ability to learn Latin easily got him noticed and a head for numbers got him assigned as a clerk to the legion’s offices by a friend in the staff section. He is currently having a secret affair with another soldier’s woman, a member of a local tribe and her brother and his wife are currently spreading scurrilous rumours about him. Aulus’ centurion is looking to promote him to actuarius in the future. Mechanically, 43 AD is fairly simple, using a roll of two six-sided dice plus an Attribute—Might, Fate, Craft, or Learning to beat a difficulty number. This is usually ten, but can be higher. The use of skills, from Acting, Carry Burden, and Detect Lies to Two Attacks, War Cry, and Work Horse enable a character to do something without the skill he would not be able to. There is no skill roll as such, although knowledge and use of a skill might grant a character a bonus on an attribute roll. In general, Might is used for combat and physical actions; Fate is used a a luck saving throw, for example to survive a poisoning attempt, spot an ambush, and so on, but can also be expended to call for divine aid and automatically succeed at an action; Craft is used for construction and making repairs; and Learning for knowledge and social actions. Combat uses the same mechanic and has a brutal quality to it. Opponents make opposed rolls of two six-sided dice plus their Combat value, which is equal to their Might plus the killing efficiency of their weapons. Results of zero mean a draw; if one opponent rolls higher than the other by one, two, or three points, then he inflicts that many number of points in terms of damage; if he rolls four or higher, then he inflicts a Crippling Blow—attacker’s choice; and if he rolls eight or higher, then he can inflict a maiming blow. It is possible to roll this by one of to means. First by rolling a natural twelve, which enables a player to roll and add another six-sided die. Second by saving the bonus one, two, or three points rolled higher than an opponent, the character making a feint maneuvre rather than an attack. These can be saved up and used in a later combat round, but are lost if the character suffers any damage. Fate can be spent to fight on despite having suffered a Crippling Blow, but armour can stop damage also. For each point of armour worn—one for a helm or mail, two for a breastplate, and three for segmented armour—a defender rolls a six-sided die. If a six is rolled on any of them, then the attack is negated! First aid is available and turns out to be quite effective, though combat is brutal and likely to leave scars. As well as tables for Crippling Blows and Maiming Blows, there are tables for Stunning Blows for unarmed combat too. For example, Aulus has heard some of the rumours that Cunittos, the brother of the girl he has been seeing, has been spreading about him. He goes to see him to persuade him to stop, but instead Aulus annoys Cunittos, who calls the German, “A Roman lackey, a Rhine ox yoked to the legions!” Aulus yells back that he will have no choice but to point out that the Briton has been cheating on his taxes—and whether or not this is true—Cunittos is angered enough to grab a sword and swing it at the stocky German. Cunittos is a trained, but not seasoned warrior—the local tribe has gone soft under Roman occupation— and has a Might of 3 and a Long Sword of +2 to give a Combat value of 5. It would be higher, but Cunittos only grabs has sword, not his sword and shield. He is, however, wearing some protective magic in an amulet, which which has a Armour Value of 2 and works in a similar fashion to armour. Aulus has his dagger and his gladius, is wearing mail, but not carrying his shield. So this gives him a Combat value of 8. In terms of character improvement, 43 AD provides two tracks. These are based on character action from assignment to assignment rather than on nebulous experience points. First, for participating and succeeding on missions, characters earn Glory which not only earns them awards, but also gets them noticed. Once their superiors recognise them, might be appointed to a junior position like Optio (deputy to the centurion), Artificer (military engineer), or Actuarius (military scribe). Once a character has held four of these positions, then he is eligible to be promoted to centurion. These positions each grant a skill, but some also have requirements, typically Latin literacy. To improve his attributes—and also to restore any fate expended on calling for divine aid or using certain skills—a character will need to make sacrifices to his god. He can also join a collegium, which grants him access to a brotherhood and a skill. Both sacrifices and collegium membership costs sestertii, so legionaries will need a way to make money, either through promotion, loot, gambling, or awards. All together, this makes progression more of a thoughtful process with the greater opportunity for roleplaying away for missions. 43 AD provides a great deal of background about the Roman legions—operations, daily activities, campaigns, and fortifications; the Roman occupation and pacification of Britannia; and the tribes of the newly conquered province. There is a lot of information presented here, all of it useful and all of it content that the Game Master could bring to his campaign. Yet, there is a fair degree of repetition in that information, especially in terms of what the Legions and the Legionaries do.Included in all of this information are maps of the province, fortification lines, tribal hills forts and duns, plus NPC stats for locals and legionaries, and a starting location. This is Danum Fort, located on the River Don, currently manned by the First Cohort of Morini, all from a tribe in Belgica province. It includes more NPCs and several adventure ideas, one of which is inspired by the work of Sir Arthur Conan Doyle and another which involves a Night Hag. This is in addition to the plethora of adventure and campaign ideas which can be found throughout the book, enough to keep a campaign going for multiple sessions. Rounding out the book is a reference section and decent bibliography. Much of the focus of 43 AD has been on the horror in a campaign involving the invasion, occupation, and pacification of a foreign land, including references to the Vietnam War. An option is given though, to add both the supernatural and horror to a campaign. In this, it takes its inspiration from films such as Aliens, Dog Soldiers, The Bunker, Predator, and others. The horror though is used to explain why the Britons do what are to Roman eyes, certain barbaric things—cutting off the heads, the throwing of human sacrifices into peat bogs in particular ways, tying victims to posts at the bottom of deep pits, and so on. 43 AD is relatively light on advice for the Game Master on running a horror campaign, so she may have to look elsewhere should she want such advice. Of course, there are plenty of supernatural threats detailed, from Cave Crawlers and Hunting Crows to the Invisible Hound and Vengeful Spirits, plus several individuals of a supernatural nature. A number of quite dark and twisted spells are included, but these are only available to Druids and Witches and they are both NPC types. What is missing from the rules are any means of handling the response to the horror inherent to a 43 AD campaign, whether it involves the supernatural or not. So no sanity or shock rules, which given the emphasis on both types of horror in the setting, is disappointing. Physically, 43 AD is generally tidy and decently illustrated. Much of the art depicts the brutality of Roman occupation, and whilst it is not explicit, it is not pleasant either. Whilst the maps are easy to read, they are not necessarily as crisply presented as they could be. The main problem with 43 AD is that it could be better organised so that the rules sections could be together and it does need another edit to excise the repetition. One issue that 43 AD does not address is that of playing female characters. Now it is a military roleplaying game and a historical roleplaying game, so the playing of male characters only is very much part of its set-up. Yet despite that, some ways around it could have been suggested, perhaps by allowing native characters to included as guides? It remains though a very male-orientated game, but that is very much in keeping with the setting and not the fault of the game itself. And anyway, the set-up allows for a diverse range of character types and backgrounds—from all over the Roman Empire. The biggest disappointment with 43 AD is the lack of rules for handling horror and its effects, but a good Game Master and players happy to roleplay this should be able to sidestep the issue. That aside, 43 AD - Invasion & Insurrection - Roleplaying in Roman Britain does a fine job of bringing the horror of campaigning in a foreign land—one we are all familiar with—to life.